In OOP, real-world objects are each viewed as seperate entities having their own state which is modified only by built in procedures, called methods. Because objects operate independently, they are encapsulated into modules which contain both local environments and methods. Communication with an object is done by message passing. We said that OOP structures your code around objects. Let’s review what an object is and what it means in the context of OOP. 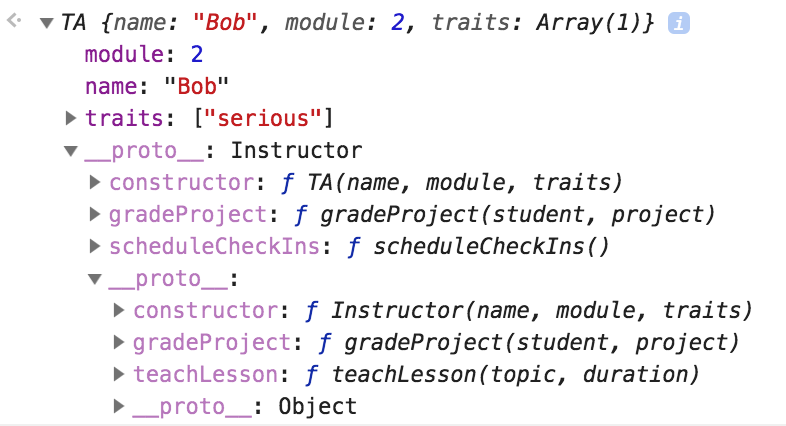 Let’s go back to the instructor object we created earlier - say we’re building an application for Turing that provides profiles for all the instructors on staff. We’d have to create about 30 different instructor objects that all have the same properties and methods, but whose values each vary. (e.g. each instructor has a different name). This could be really repetitive and exhausting to build out individually. This is where Classes come into play. Classes are templates, or blueprints, for creating many objects that share properties and behaviors, but might vary in their values. Take the school object that you created during the warm up and rewrite it as a class. Now that we have our Instructor class, we can spin up a bunch of instructor objects by creating instances. An instance is a single object created based on the template provided by the class. We declare a new variable, and use the new keyword to instantiate a new object from our Instructor class. This is a lot more concise than creating separate object literals for each of our instructors, saves memory (as both instances now share the same teach and grade methods), and DRYs up our code significantly. Being able to re-use a class template to create multiple objects is one of the core benefits of OOP. Another benefit we see here is called encapsulation. Only the pam variable knows anything about that instance’s name, module, and trait properties. The brittany variable doesn’t know anything about pam, and it doesn’t have to! Each instance property is scoped directly to that particular instance. We want our objects to know as little as possible about each other. This prevents them from having unintended effects on each other, and allows them to work independently. For example, if brittany relied on pam being funny and smart, and all of a sudden pam became boring and stupid, now brittany could potentially be broken. This connectedness between the two objects is referred to as coupling. The more objects depend on each other, the more tightly coupled they are. A good goal as a programmer is to make objects as independent as possible, meaning they can be tested as stand-alone units and don’t have too many dependencies on other objects to perform their respective duties. Coupling refers to the level of connectedness between two objects. It’s inevitable that objects will need to interact with one another, and therefore can create dependencies. A good goal as a programmer is to make objects as independent as possible, meaning they can be tested as stand-alone units and don’t have too many dependencies on other objects to perform their respective duties. Avoiding these dependencies means following the single responsibility principle and the principle of least knowledge. These concepts suggest that each of our objects should have a single, focused duty, and should know only as much information as it needs to perform it. This creates fewer dependencies and prevents bugs from creeping into our codebase. A good comparison would be to think about how our organs work - a heart can be maintained for transplant in a box because it’s completely unaware of its surroundings and doesn’t know that it’s not inside a body because it has a single responsibility: to beat, and knows as little as possible about the rest of the system it’s attached to. We have a top-level parent class called Instrument. An Instrument might have a name, and be able to play music. 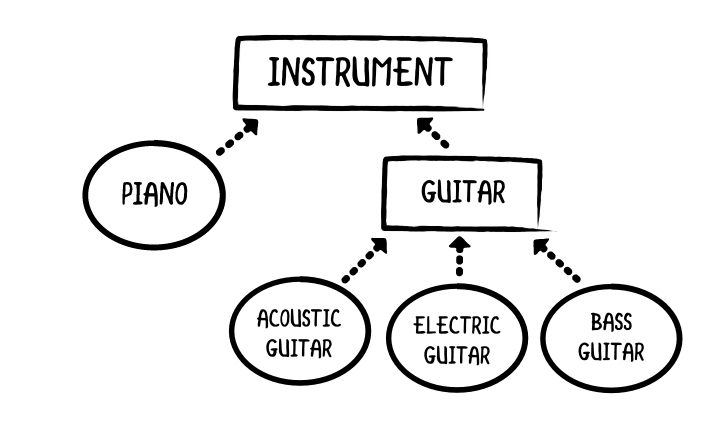 But then we can branch out further from there, and create guitars, pianos, violins, etc. Each of these more specific instruments should all still have a name and be able to play music - but they might start having their own behaviors and properties. For example, a guitar might have a property that denotes if it’s acoustic or electric. A piano might have a property that denotes how many keys it has. As we get more specific, we create new classes that are based on our parent Instrument, and we allow them to each inherit the name property and the ability to play music from that parent. This allows us to share a single method across many subclasses, keeping our code DRY and performant. Let’s go back to our previous example and create some Teaching Assistants, which are a more specific type of instructor. Teaching Assistants should have a name, module, and traits property, just like instructors do. They should also be able to teach lessons, grade projects, and schedule check-ins. Because TAs have so much in common with Instructors, we can create a child class or a sub class that inherits all of the properties and methods from our Instructor class. The only new behavior we need TAs to perform is to schedule check-ins. The super keyword is used to access and invoke methods on the parent class. In the example above, the super keyword is used to invoke the constructor method of the parent class. This will allow the parent constructor to add any inherited properties to the new instance of our class. With a partner, think about your last trip to the Zoo and come up with at least three things that could be templated with a class. What properties and methods might it have? Come up with a subclass that could inherit from it and either add new behaviors, or override existing ones. Create a repl for them! Here you can see the entire prototype chain, and how bob is inheriting properties and methods from the Instructor class. This is called prototypal inheritance. What are the core benefits of OOP? What does the constructor method do?